Please refer to our stock # 4287 when inquiring. 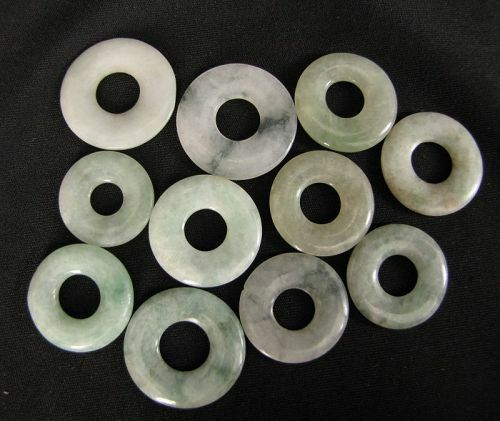 Ten jade perforated untreated Jadeite discs, circa late 1880 to 1950. These retail for about $30.USD each in a Hong Kong. I acquired from a Hong Kong jade dealer going out of business due to the ever increasing rents here. Average diameters are between 2cm and 2.5cm and thickness between 2mm and 4mm. These were imported into Hong Kong during the 1980s when local dealers could buy direct from Chinese government owned Arts and Curios Department (usually by the kilo). This meant they were approved for export by the Cultural Relic Department. Anyhow these are still in good condition, nice and shiny (but not “brand new” shiny) - no two are the same. There may be the odd inclusion or flea bite chip but the majority are good so please view enlargements carefully. Free shipping via Hong Kong Registered Airmail. I have 19, 10 piece lots for sale so drop me a line if you would like to buy wholesale.